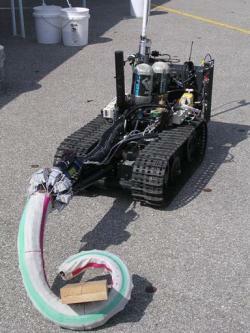 Octarms - Robotic Tentacle Bot From Mars! Octarms, developed in the OCTOR project (sOft robotiC manipulaTORs), are robotic tentacles that can grasp a variety of differently shaped objects. Octarm development is funded by DARPA, under their BIODYNOTICS (Biologically Inspired Multifunctional Dynamic Robots) program. An Octarm is powered by compressed air; pressure sensors on the surface of the tentacle, positional sensors and a camera on the tip provide the functionality. Octarms have explored the interior of pipes and picked up irregularly shaped objects. Manipulation of fragile objects has also been accomplished. One of the problems with most robot "manipulators" or mechanical claws for grasping is the difficulty in grasping objects with irregular shapes (like many natural objects), or objects that are fragile (like eggs or tomatoes). Octarms belong to a special class called "continuum robots" because they mimic the abilities of natural organisms with lack the rigid links of traditional robots. The OCTOR project looked at more than just hardware; a mathematical foundation for encircling objects of widely varying sizes and unknown shapes was created in software. For additional information on how robots can pick up fragile objects, see this article on pressure-sensitive skin for robots. 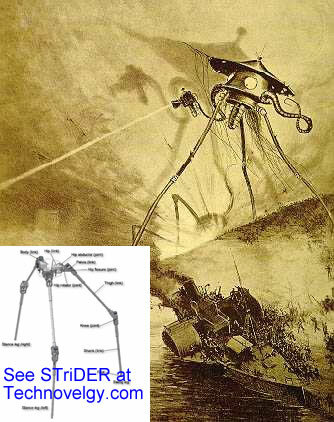 The RISE six-legged robot is another result of DARPA's BIODYNOTICS program. The original article was found here; see also the OCTOR Octarm website. Thanks to Adi for the tip on this story.